Friedrich Bauer was Professor of Mathematics at the University of Gutenberg before becoming Professor of Computer Science at Munich University of Technology. He is the author of the classic Decrypted Secrets: Methods and Maxims of Cryptology. David Bolam is one of the engineers who built the Colossi. After the war he was involved in the automation of the national telephone system and eventually its computerisation. Stephen Budiansky is a writer and historian. His books include the bestseller Battle of Wits: The Complete Story of Codebreaking in World War II, Air Power , and Her Majesty’s Spymaster, a biography of the Elizabethan spymaster Sir Francis Walsingham. He is a correspondent for The Atlantic Monthly. Frank Carter is a specialist in the history of codebreaking. He is the author of a series of booklets on codebreaking published by the Bletchley Park Trust and lectures regularly at Bletchley Park, now a museum. Catherine Caughey volunteered for the Women’s Royal Naval Service (WRNS) in 1943 and was allocated to “Special Duties X” at Bletchley Park, where she joined the Newmanry and worked as one of Colossus’s operators from the beginning of 1944. Later she took responsibility for the Newmanry’s teleprinter room, where Tunny messages were received from the main intercept station in Kent. After the war Caughey trained as an occupational therapist. She died in 2008. Jack Copeland is Director of The Turing Archive for the History of Computing and is Professor of Philosophy at the University of Canterbury, New Zealand, where he specialises in mathematical logic. His books include Artificial Intelligence, Logic and Reality, The Essential Turing, and Alan Turing’s Automatic Computing Engine: The Master Codebreaker’s Struggle to Build the Modern Computer. Helen Currie joined the Auxiliary Territorial Service (ATS) in 1938, training as an intercept operator in 1942. This led to her transfer to Bletchley Park, where she joined the Tunny-breaking section called the “Testery”. Initially her job was to translate punched paper tape into German by sight; later she operated a British copy of the German Tunny machine which produced the German plaintext automatically. After the war she entered local government and served as a magistrate. Dorothy Du Boisson joined the WRNS in 1943 and was posted to Bletchley Park. 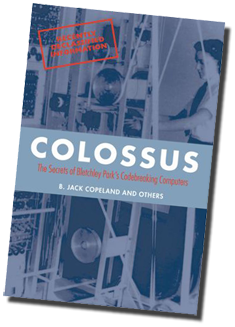 In the Newmanry during the pre-Colossus period she operated Heath Robinson; she then moved on to the prototype Colossus and the “Mark 2” Colossi. Finally she became a registrar in the Newmanry’s “Ops Room”, where she was responsible for distributing and tracking the tapes containing the encrypted messages. The war over, she went into the Air Ministry as Controller of Typists and later became a senior administrator in the Ministry of Defence in Whitehall. Peter Edgerley was recruited to Bletchley Park in 1942. He joined the attack on Tunny in the Testery, where he specialised in breaking Tunny messages “by eye”. After the war Edgerley became a research scientist with ICI Plastics. He died in 2007. Harry Fensom joined Flowers’ inner circle of engineers at the Research Branch of the British Post Office in 1942. He participated in the construction of various codebreaking machines, including Heath Robinson, Colossus I, and Colossus II, and was responsible for keeping the machines in continuous operation at Bletchley Park. Following the war Fensom designed ERNIE, the electronic randomiser used to produce winning numbers in the government-run premium bond lottery. He patented the first fully-electronic telephone and designed various electronic systems for use in telephone exchanges. He died in 2010. Thomas Flowers joined the Post Office Research Branch in 1930, where he became Head of Switching Research. During the 1930s Flowers pioneered large-scale digital electronics. In 1943 he designed and constructed the prototype Colossus, followed in 1944 by the first of the Mark 2 Colossi. After the war he developed the concept of the all-electronic telephone exchange. Flowers left the Post Office in 1964 to join Standard Telephones and Cables, publishing his text Introduction to Exchange Systems in 1976. He completed his chapters “Colossus” and “D-Day at Bletchley Park” shortly before he died in 1998. Jack Good joined Bletchley Park in 1941, where he worked first on Enigma and then on Tunny, becoming principal statistician in the Newmanry. After the war he was offered a lectureship in mathematics at the University of Manchester but in 1948 returned to codebreaking at Bletchley Park’s peacetime successor, GCHQ. In 1967 he left England for Virginia Polytechnic Institute where he spent the rest of his life, initially as Research Professor of Statistics and from 2004 as Emeritus University Distinguished Professor. Good’s books include Probability and the Weighing of Evidence and Good Thinking: The Foundations of Probability and its Applications. He died in 2009. Gil Hayward joined Flowers’ group at the beginning of 1944. He had special responsibility for the British Tunny machines, used to decrypt messages once the codebreakers had deduced the “settings” of the message. After the war he worked on a secret voice-encipherment system at the Post Office Research Branch. Later he joined the Special Branch of the Royal Malaysian Police, designing “special techniques devices” for use against insurgents. Peter Hilton was recruited to Bletchley Park at the beginning of 1942 and worked first on Enigma, breaking “Offizier” (“Officers’ Eyes Only”) naval traffic. He transferred to Tunny towards the end of 1942 and soon became chief cryptanalyst in the Testery. Hilton went on to become a distinguished mathematician: he was appointed Professor of Pure Mathematics at the University of Birmingham in 1958, then moved to the United States to become Professor of Mathematics at Cornell University and finally Distinguished Professor of Mathematics at the State University of New York. His books include Homology Theory and Course in Homological Algebra. He died in 2010. Eleanor Ireland joined the WRNS early in 1944 and was posted to Bletchley Park. In the Newmanry she operated the Colossus computers until the end of the war, and helped to break up the machines after the Allied victory. She went on to become an artist and illustrator. Her paintings have been exhibited in the Royal Academy. Roy Jenkins joined the newly formed Testery in 1942, and worked on Tunny until the fall of Berlin. He entered the House of Commons in 1948 and was Home Secretary (1965-67 and 1974-76), Chancellor of the Exchequer (1967-70), and President of the European Commission (1976-81). Jenkins co-founded the Social Democratic Party in 1981. He became Lord Jenkins of Hillhead and Chancellor of the University of Oxford in 1987. He died in 2003. Craig McKay is an expert on the history of signals intelligence. His books include From Information to Intrigue and Swedish Signal Intelligence 1900-1945. Donald Michie joined Bletchley Park in 1942 and worked on Tunny, first in the Testery and then as Max Newman’s assistant in the Newmanry. He made an all-important contribution to the design of the Mark 2 Colossi. After the war he became a geneticist and then in the 1960s switched careers, founding the first European centre for Artificial Intelligence research and becoming Professor of Machine Intelligence at the University of Edinburgh. Michie’s books include On Machine Intelligence and The Creative Computer. He died in 2007. Ken Myers joined the team of engineers building Colossus I in Flowers’ laboratory in 1943, and at the beginning of 1944 moved to Bletchley Park to install and maintain codebreaking machinery. After the war he worked on the problem of coordinating London’s traffic lights. Max Newman joined Bletchley Park in 1942 to work on Tunny in the Research Section. His vision of mechanised codebreaking led to the formation of the Newmanry and the use of high-speed electronic machinery. At the end of the war he became Professor of Mathematics at the University of Manchester, where he founded the Computing Machine Laboratory and oversaw the development of the first “stored-program” electronic computer. His classic book Elements of the Topology of Plane Sets of Points (1939) remained in print for sixty years. Newman died in 1984. His essay in Appendix 7, written in 1943, would probably have been destroyed with the Colossi at the end of the war, had it not been smuggled out of Bletchley Park by an engineer. It was rediscovered only recently. William Newman designs interactive computer systems. He wrote the first textbook on computer graphics, Principles of Interactive Computer Graphics (1973); his other books include Interactive System Design. He is Max Newman’s son and biographer. Brian Randell is Emeritus Professor of Computing Science at the University of Newcastle upon Tyne and a distinguished historian of computing. His books include The Origins of Digital Computers. Jerry Roberts joined the Testery on its formation in July 1942 and went on to become a senior member of the organisation, working on Tunny until the end of the war. From 1945-47 he was a member of the War Crimes Investigation Unit. Thereafter he pursued a career in marketing, forming his own market research company in 1970. Tony Sale worked in MI5 before directing a computer software company. He founded Bletchley Park Museum in 1994 and has there rebuilt Colossus. Simon Singh is a writer and broadcaster. His BBC television documentary about Fermat’s Last Theorem won a BAFTA award and his subsequent book Fermat’s Last Theorem was a UK No. 1 bestseller (the first mathematical book to achieve this distinction). His history of cryptography The Code Book was turned into a Channel 4 television series The Science of Secrecy. Singh’s other books include Big Bang: The Origin of the Universe. Michael Smith specialised in signals intelligence as a member of the British Army’s Intelligence Corps and now writes on defence and security issues for the Sunday Times. His books include the UK No. 1 bestseller Station X: The Codebreakers of Bletchley Park, Foley: The Spy Who Saved 10,000 Jews, and The Spying Game. Geoffrey Timms joined Bletchley Park in 1944 and worked on Tunny in the Newmanry. At the end of hostilities he wrote General Report on Tunny with Good and Michie. Timms remained with GCHQ after the war, applying computer techniques to codebreaking. He died in 1982. Norman Thurlow joined the Post Office Research Branch in 1937 and was recruited to the engineering side of the codebreaking operation in 1942. At first he dealt with machines for use against Enigma, but soon moved to the Newmanry and was closely involved with Heath Robinson and the Colossi. Thurlow remained with GCHQ after the war. He died in 2008. Bill Tutte was recruited to Bletchley Park in 1941, becoming a leading member of the Research Section. For a few months he worked on Italian ciphers, then turned his attention to the problem of Tunny. Tutte made three major breakthroughs which formed the backbone of the operation against Tunny: he deduced the structure of the Tunny machine, he devised the “statistical method” which made Heath Robinson and the Colossi possible, and he invented the method of “rectangling” necessary to keep pace with the Germans’ daily changes to the Tunny code-wheel patterns. At the end of the war Tutte was elected a Fellow of Trinity College, Cambridge, and subsequently became Professor of Mathematics at the University of Waterloo, Ontario. His books include Introduction to the Theory of Matroids and Graph Theory. He died in 2002. Frode Weierud is the leading expert on the German cipher machine that was codenamed “Sturgeon” by Bletchley Park. He is a computer specialist at the European Organisation for Nuclear Research (CERN) in Geneva. Benjamin Wells is Professor of Mathematics and Computer Science at the University of San Francisco. He has lectured widely on Colossus. His books include The Metamathematics of Algebraic Systems.